Stephanie Chen makes a strawberry hibiscus curd for her Strawberry Hibiscus Pie recipe. Judge Mary Berry helps Stephanie as she vigorously whisks her curd by wiping her brow. Stephanie's whisking workout will lead to a smooth strawberry pie that is scented with an herbal hibiscus tea. She purees the hibiscus with the sugar and incorporates it into the curd as she is cooking it. This allows for the flavors to come through without a rough texture in her Signature bake featured in Season 2 Episode 4, "Pies and Tarts Week," of The Great American Baking Show. 1. Set up a double broiler so a heatproof bowl can sit over a large pot filled with an inch of simmering water. 2. In a small food processor, add sugar and dried hibiscus and blend until hibiscus is finely ground. Add into the mixing bowl. 3. In the same food processor, add cleaned and de-leaved strawberries and puree until fine. 4. In the mixing bowl with hibiscus sugar, add strawberry purée, eggs, egg yolks, lemon juice, lemon zest, and sift in the cornstarch. Whisk to combine. 5. Separately, prepare a bowl with a fine metal strainer on it. 6. With stove on medium-high heat, cook, whisking continuously, until mixture thickens and reaches 170°F on thermometer, about 4-5 minutes. Don't stop early until the mixture is thick. 7. Remove bowl from heat and strain curd through a fine metal strainer. 8. Add butter and whisk to melt and combine. 9. Cover in plastic wrap directly on the curd and refrigerate while you bake the crust. 1. Preheat oven to 400 °F. Place pie pan into the refrigerator. 2. Cut the cold butter and cold shortening into cubes and place into the freezer while you start to prepare the flour. 3. Put flour, salt, and sugar into the bowl of a food processor fitted with a steel blade. Pulse to mix together all the dry elements. 4. Add in butter and shortening into the processor and pulse 10-12 times or until the butter comes out to pea sizes. Then with the processor running, add in the ice water until the dough turns into a ball. Do not over add water! 5. Remove dough onto a floured surface cut form into a flat disc. 6. Wrap in plastic wrap and place into the freezer for at least 10-15 minutes. 7. Once chilled, lightly flour your surface and remove from plastic wrap and let it sit for a couple minutes at room temperature. 8. Flour your rolling pin and start rolling out the disk to a round dough turning it a quarter of the way and rolling it out so it's an even circle. Reapply flour to counter as needed. 9. Pick the dough up with the rolling pin and place gently on the pie tin. 10. Press into the pie tin (especially in the bottom edges of the pan) and then trim the pie edges so it's hanging 1 inch over the edge of the pan. 11. Fold and roll the pastry under so it's even with the plate and crease the crust edge as needed. Put back into the freezer to chill for 10 minutes. 12. Take a large piece of parchment paper and crumble it up. Spray one side with baking oil spray so it doesn't stick to the crust that is baking. 13. Remove pie from freezer and using a fork, poke holes throughout the bottom and sides of the crust. Add greased parchment paper and then add pie weights to the top. 14. Place into the oven and bake for 25 minutes or until crust edges are light golden. Remove parchment paper and weights. Brush the crust with 1 egg yolk so it creates a moisture seal. 15. Reduce oven temperature to 350 °F / 176 °C and continue to bake crust until light brown for another 12-15 minutes or until it's completely dried out and golden brown. Set aside and cool. 1. In a stand mixer, add egg whites and cream of tartar. Beat on medium speed until foamy. 2. Combine sugar and corn starch together in a small bowl. 3. Once egg whites have soft peaks, increase speed of mixture to high and start adding 1 tablespoon of the mixture at a time. Continue beating until egg whites are stiff and glossy. 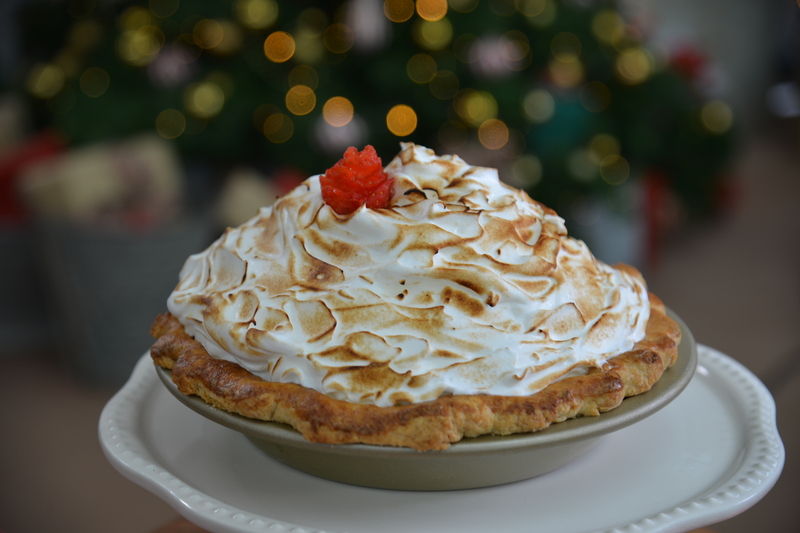 Don't over beat your meringue! If it breaks down or separates then you beat it too long. 1. Take the cooled piecrust and add the filling that should have slightly set in the fridge. 2. Take meringue and put into a large pastry bag without a tip. Swirl meringue on the pie and make sure you get it on the crust. Aim to get it higher and higher! Watch out for air pockets and fill it in slowly. 3. Take pastry torch on the lowest setting and moving in a circular motion, quickly brown the outside of the pie.